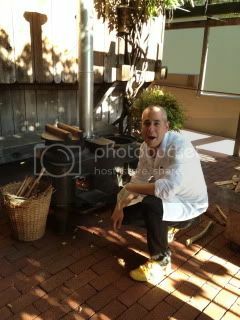 Today, I flew to San Francisco to come to the special dinner event at Chez Panisse in Berkeley. 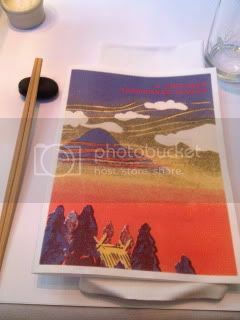 It was Nancy Singleton Hachisu's "Japanese Farm Food" book release dinner. 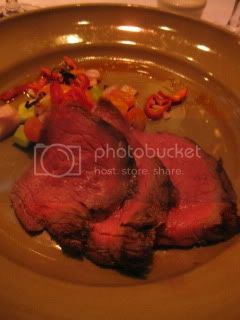 Nancy is an American lady from California and have been living in Japan since 1988. She lives in a 80-year-old farm house with her Japanese husband and children in a countryside in Saitama Prefecture. Her book is about authentic Japanese farm-to-table dishes. I had been waiting to finally have a copy of this book for months! This book is truly genuine and inspiring with beautiful photos, recipes, and stories of her life on the rustic farm. 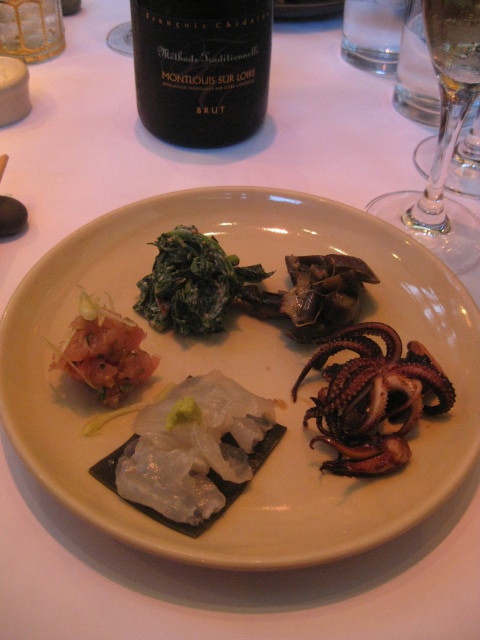 The menu was put together by Nancy herself, and the dishes were made by Peko Peko's Silvan and Chez Panisse team. 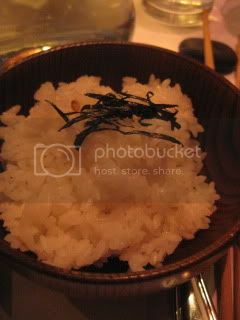 As soon as we entered the gate of the restaurant, Sylvan was cooking the special rice, which was harvested in Nancy's family farm in Japan! 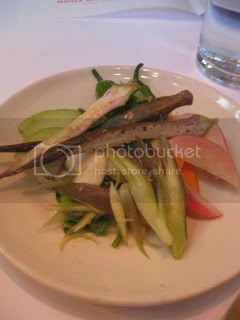 Summer vegetables pickled in rice bran with Peko Peko Ume-fizz. Beautiful start. 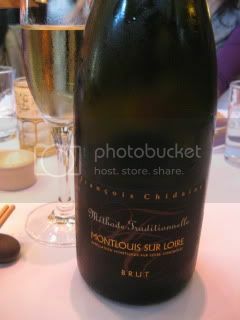 We ordered a bottle of Francois Chidaine, Montlouis Brut (Loire)...this biodynamic sparkling from Chenin was bone-dry with aromatic fruit. I was looking forward to pair with upcoming dishes. 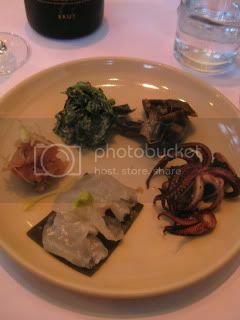 Fabulous appetizer plate...Wood-oven Roasted Squid/ Kelp-wicked Halibut with Freshly Grated Wasabi/ Albacore with Nancy's Miso and Kitazawa Myoga/ Rapini Dressed with Sesame and Home-made Tofu/ Eggplant with Chile, Shottsuru and Shiso. Hachisu Family Rice Cooked in an Iron Pot...the rice was really wonderful. I had an amazing time. Magical dinner. 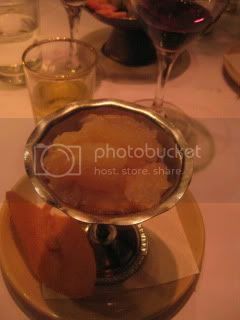 There were many distinguished people from Bay Area at Chez Panisse tonight. Even Alice Waters herself was there! It was truly an honor to meet Nancy in person...very sweet and very inspiring! 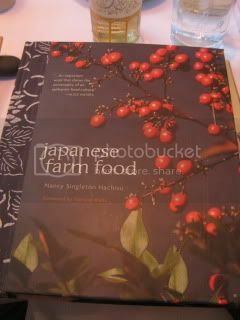 Her book should be read by anyone who loves good food whether he/she is non-Japanese or Japanese. 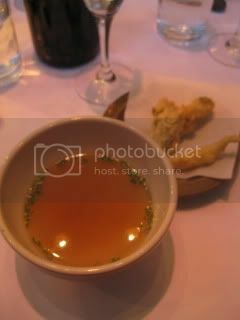 The recipes are all mouth-watering and simple enough to follow even by those who have never cooked Japanese food. Also, in her book, she uses our authentic Iga-yaki donabe, including the double-lid donabe rice cooker,"Kamado-san"! Her freshly-harvested rice, cooked in Kamado-san must taste outrageous.